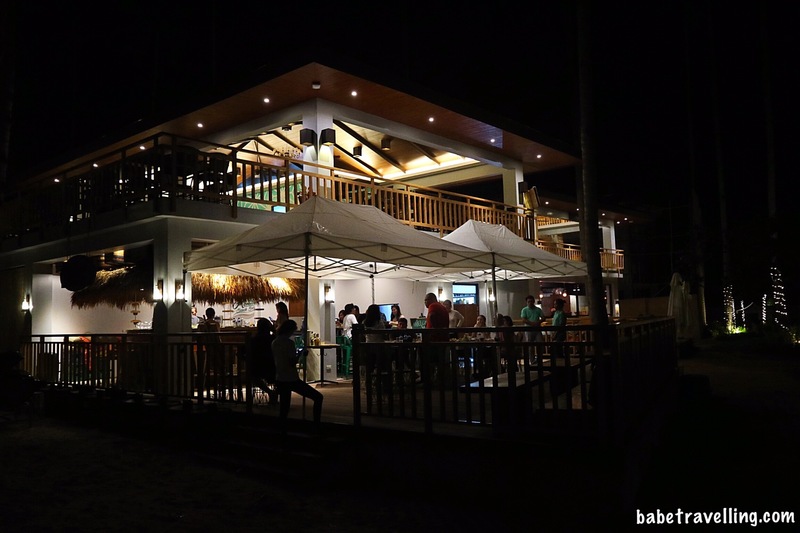 One of my favorite beach bar that is found at the ground floor at the Shops at Lio Estates, is Manille Beach Bar. If you want a decent cocktail, this place will not disappoint. Son Aaron Limpe-Aw, together with CEO Olivia Limpe- Aw of Destileria Limtuaco partnered with one of the best couple bartenders in the Philippines for this awesome beach bar. Larry Guevarra and Sharlene Antonio are presently handling the bar using Destileria Limtuaco best liquors. It is their first bar outside of Manila. What a great collaboration! 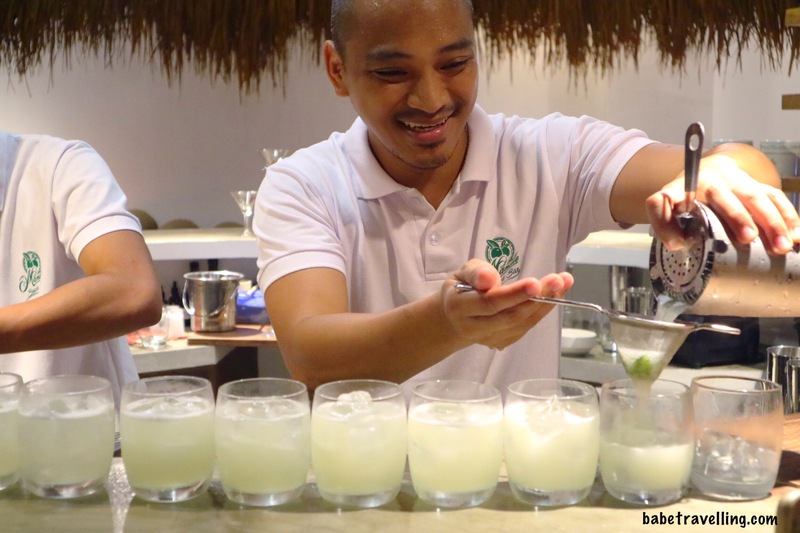 When I was called to conceptualize, partner and run a bar in El Nido, I took the opportunity right away. Who would refuse working in paradise? 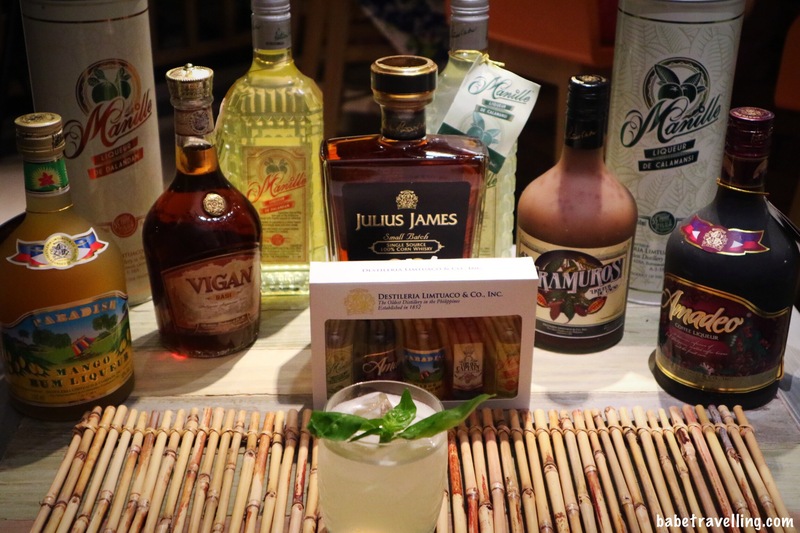 Presenting the oldest distillery in the Philippines, Destileria Limtuaco’s popular current products. Every bottle is made for every individual to enjoy drinking. They have preserved their quality and reputation over the centuries. Every one of them is made by the finest liquor makers. 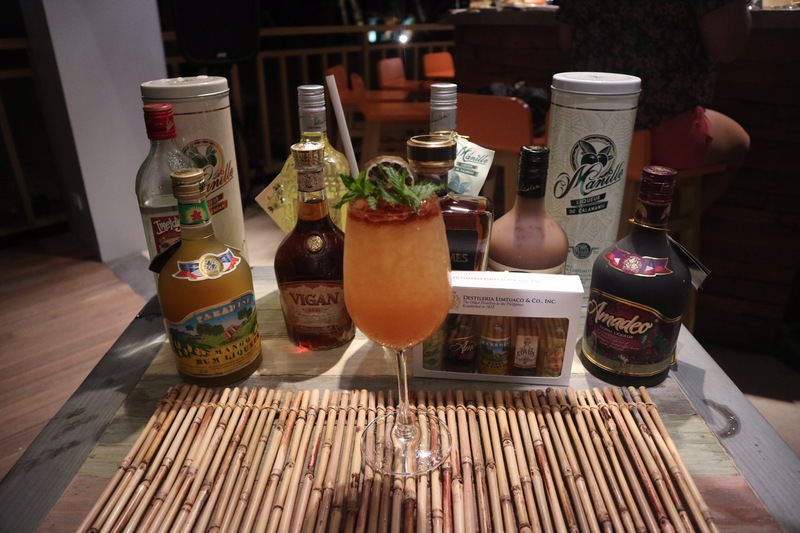 From the signature cocktails, one of my favorites would be the Calauit Park Swizzle. It served in a wine glass with lots of ice and generous topping of angostura bitters. The old captain 5 year old rum is the base here with guava juice. It tastes as good as it looks. The El Nido Gold is also great tasting. 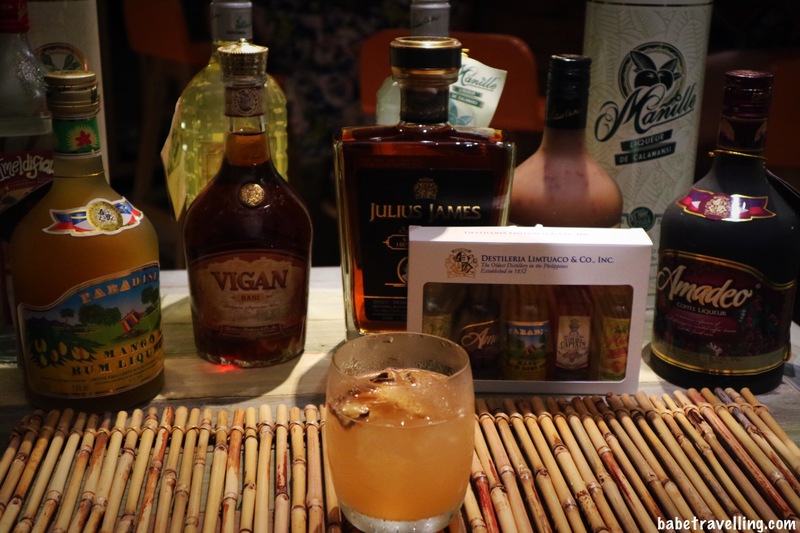 It has El Hombre Gold, Manille Liqueur, Dalandan and guava juice combined. I like how this drink is not so sweet yet flavorful. If you want some golden glitter to perk you up, this is my recommendation. Something refreshing is the Manille Basil Smash. This is a gin basil smash twist made with Empire London Dry Gin and Manille Liqueur de Calamansi. The basil is grown organically from Palawan. You can taste its freshness. Of course, there is just this thing about having food with your drinks. 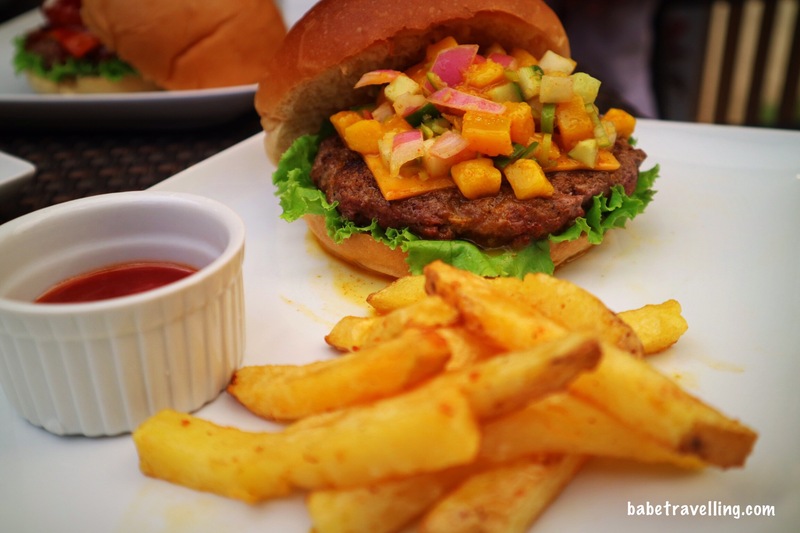 Manille Beach Bar will not disappoint you as well. 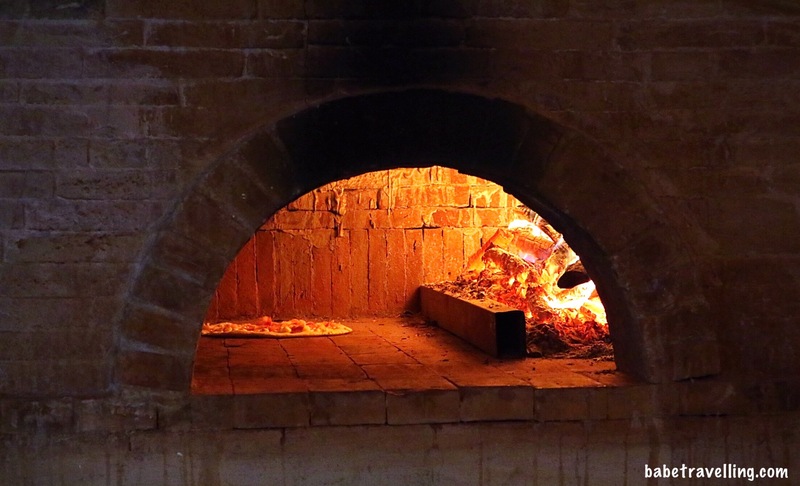 While they do so great behind the bar, they also do so great behind their kitchen. 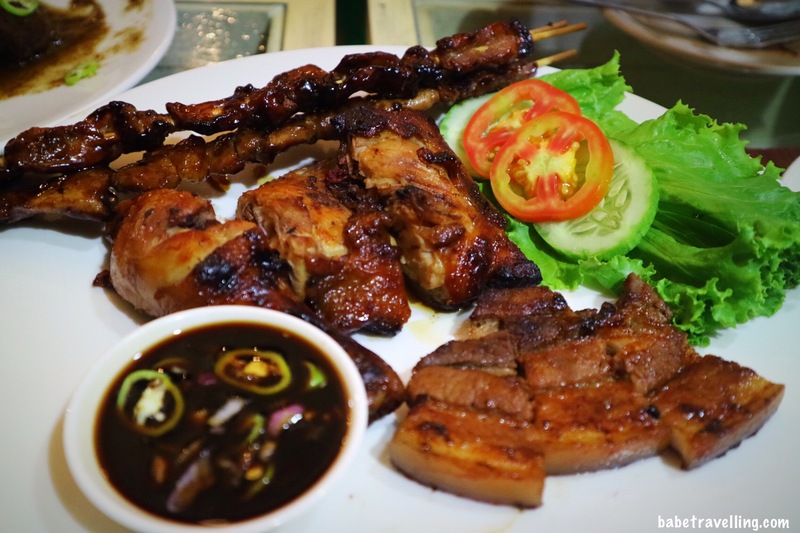 The grilled platter is composed of paradise mango barbecue chicken, pork barbecue and every Filipino’s favorite bar chow, grilled liempo. This is perfect combination for group of friends you are with. This will serve 3-4 person. 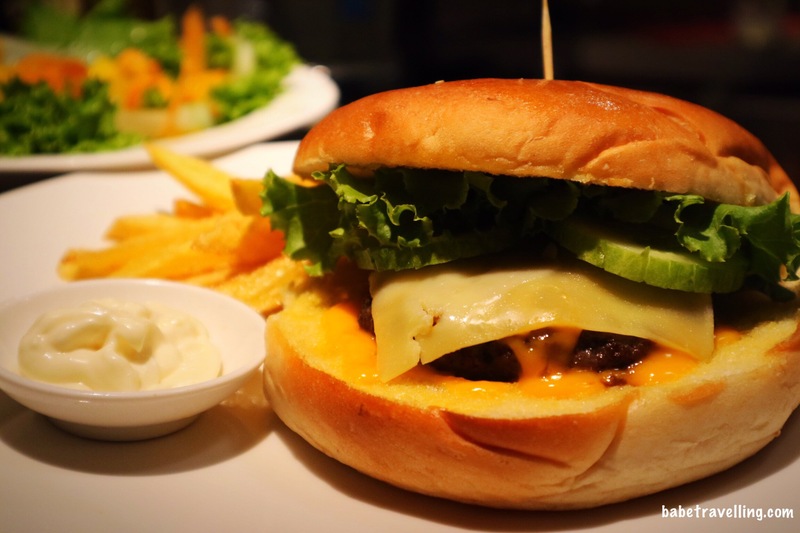 Manille also serves their 100% beef cheese burger. It is simple, basic and likeable for most. You have the patty, cheese, lettuce, cucumber and onion. This is served with side of fries. The Amedeo coffee beef ribs is a personal favorite. 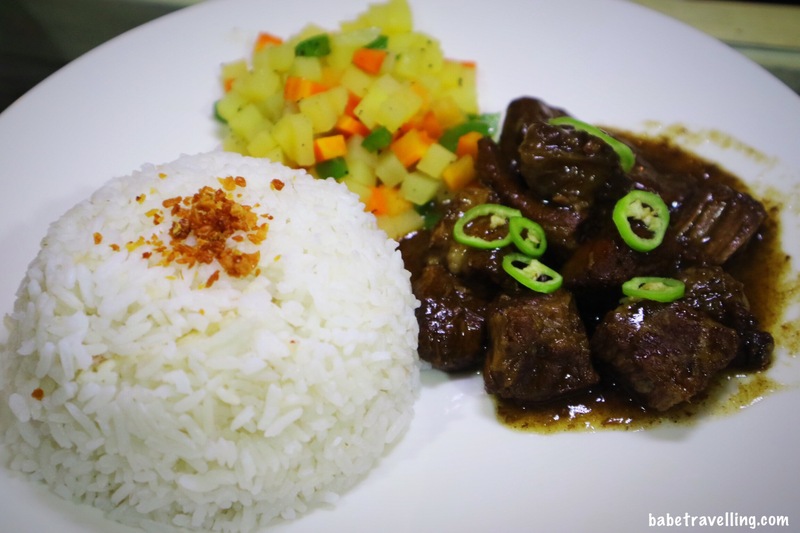 The meat of the beef is soft with the right amount of spice. The beef ribs are stewed with the Amedeo coffee liqueur. This comes with sides of rice and vegetables. 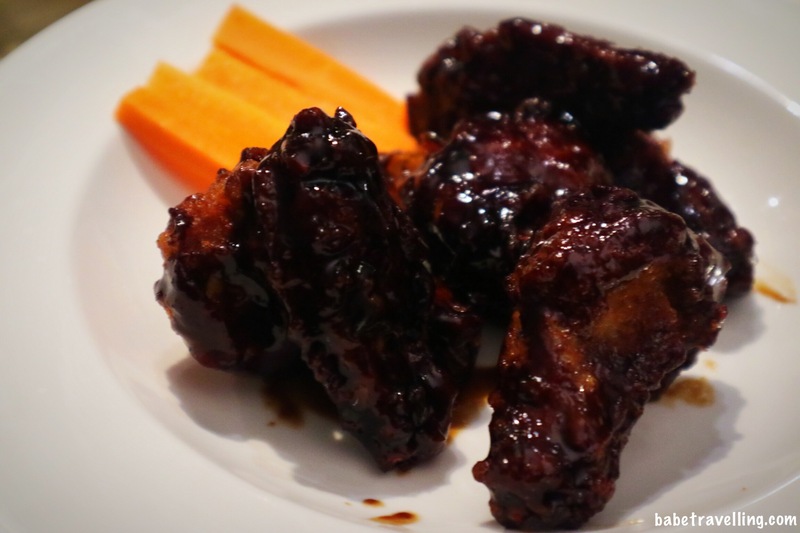 They also serve spicy chicken wings. Prepare for its sweet and tangy taste. It is a good pairing for your drinks. 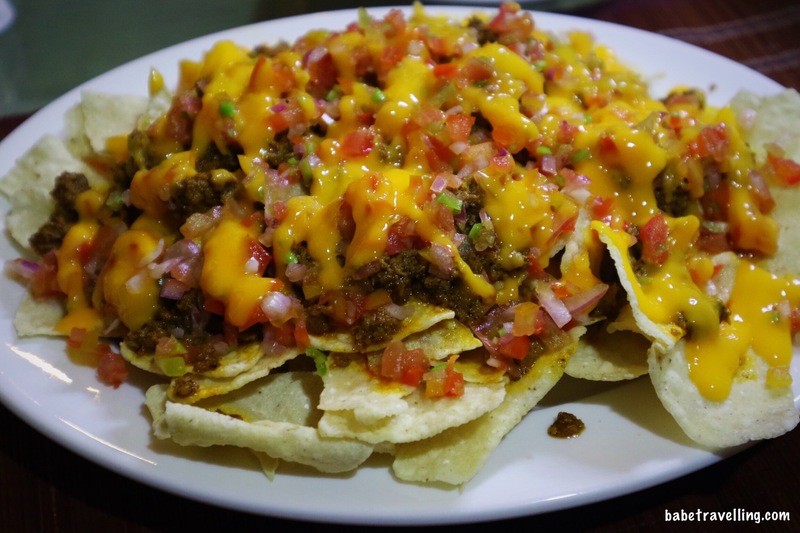 Every bar chow needs nachos. This is called the Manille Longganisa nachos. It’s crunchy, cheesy. meaty and sweet. Not all food are made behind the kitchen. 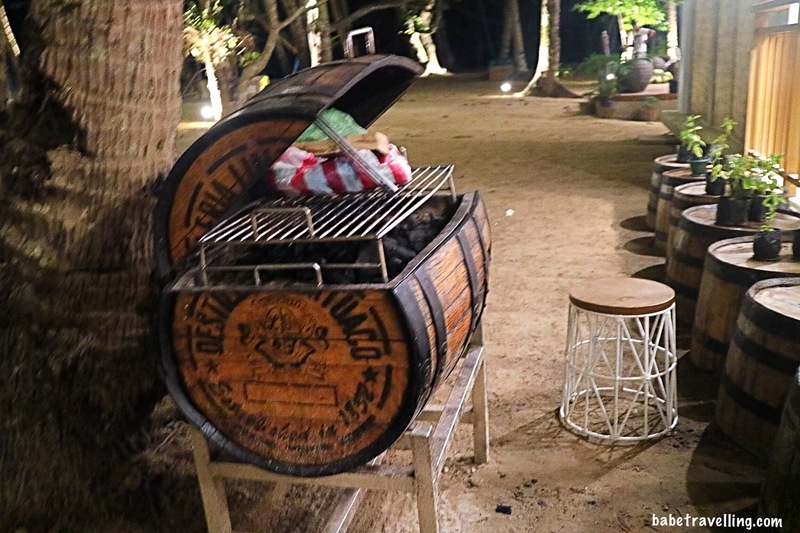 They also have this authentic grill made from a barrel in front of their bar. You can smell freshly grilled meat while its being cooked. Yummy! I just like this spot so much. From the beach front, it looks like a house party that is happening. Inside is so cozy like having your own party with guests coming from all over the world. You won’t miss this place at the shops @ Lio, just look for a beach hut inside a bar. Cheers to this awesome beach bar at Lio, Estates!